Fresh pasta is probably the most important ingredient in Italian cuisine, and is actually much easier to make than most people think. I want to share with you the basics of making the perfect pasta dough, which you can translate into so many shapes and sizes (check out our guide). Bologna is the city in Italy that is the most famous for pasta. Long, short, filled, flat, twisted, you name it, they make it, and each variety has a specific purpose. 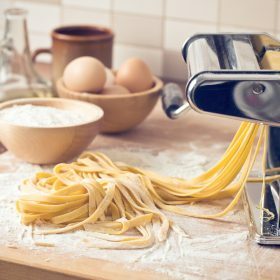 Spaghetti, linguine, fettucine, penne, ziti, bucatini, cannelloni, farfalle, fusilli, pappardelle, orecchiette, ravioli, tortellini are just some of the hundreds of pasta shapes that you can make when you know how to make the perfect dough. Start with the best ingredients—fresh eggs, imported Italian “00” flour, and water… it only takes 3 ingredients, a rolling pin and your hands! If you have a stand mixer, pasta roller and shaper it will save you time and create the smoothest dough. With this recipe I will make pappardelle, a flat noodle that is larger than fettucine and is a perfect pasta for hearty meat and vegetable sauces. So let’s get rolling and make fresh pasta! Fresh pasta is one of the staples of the Italian cuisine, but how do you make it? Follow these steps below to make perfect homemade fresh pasta. Add flour, eggs, and salt in the mixing bowl and attach the dough hook. Turn to speed 2 and knead for 5 minutes. Remove the dough and knead by hand for 2 minutes. Shape into an oval disc and let it rest for 30 minutes wrapped in plastic wrap. With a kitchen knife, cut the dough into a 1-inch piece and flatten into a rectangular shape, add a small amount of flour to both sides. Attach the pasta sheet roller to your stand mixer and set it to #1. Turn on the stand mixer to speed 2 and run the pasta dough through the roller. While on #1, fold the dough in half and run it through again. Do this twice. Adding a little bit of flour on each side of the dough again, change setting to #2 and pass the pasta dough through the sheet roller. Do this twice and then twice each on #3 and then once on #4 #5 #6. Dust the top of the pasta sheets with flour and loosely roll into a cylinder. Cut into 3/4-inch wide slices. Unwrap the noodles and gently toss to separate. Place on a sheet pan and cover with a kitchen towel.